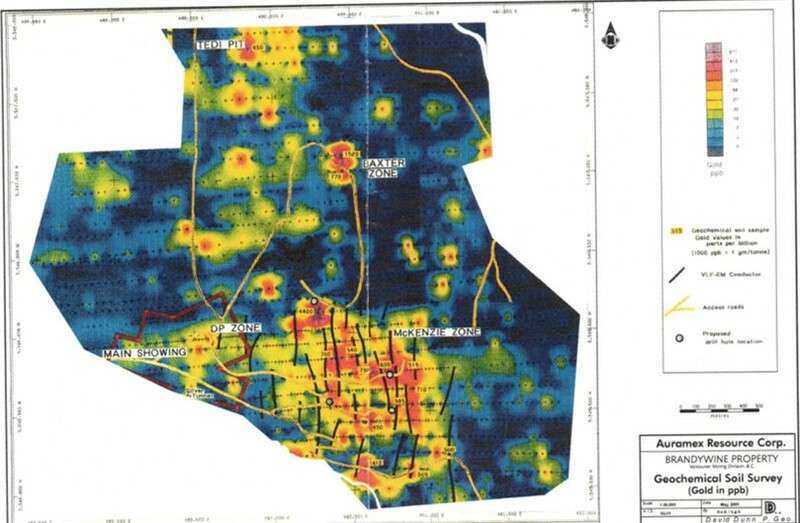 drilling, and extensive geochemical and geophysical studies. and other metal values, as summarized below. oz Au/ton; 0.19% lead and 0.34% zinc. Additionally, the reports identify the presence of Pyrargyrite (Ruby Silver), as well as the rare silver specimen minerals, diasphorite, fizelyite, (rare silver-lead-antimony Sulfosalt) semseyeyite, miargyrite,(silver, antimony sulphide) and prostilpnite (Ag, Sb, S), all indicative of the presence of high grade silver, as well as the rare mineral hubernite on the property. The Company advises that the information presented herein, including the accompanying MinFile Reports, is of a historic nature. 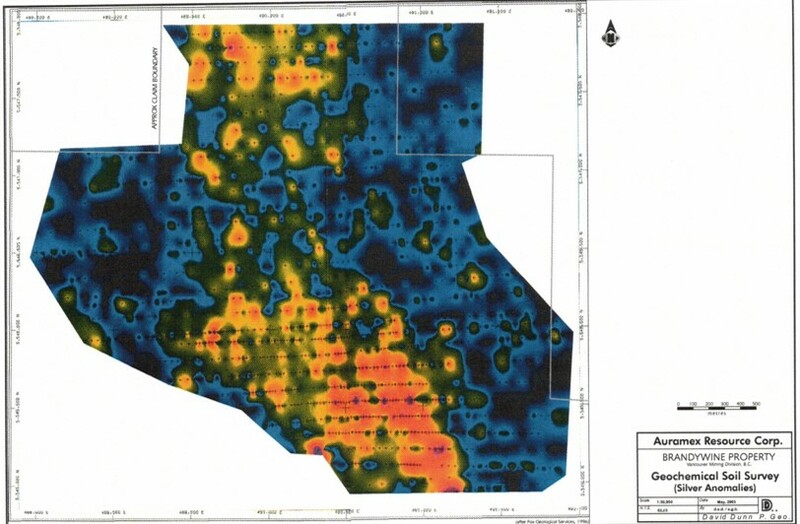 Historic soil anomalies (above) drill hole data, production estimates and grades reported have not been verified. A qualified person has not done sufficient work to verify the historical estimates nor classify the historic estimates as current mineral resources or mineral reserves, and the Company is not treating the historical estimates as current mineral resources or mineral reserves. assurance that any such deposit may be economically recoverable. Eskay Creek, British Columbia, Canada. resource of 295,000 tonnes grading 7.1 g/t gold and 82 g/t silver. Green’s Creek, Admiralty Island, Alaska, USA. silver, 0.09 oz/t gold, 3.0% lead, 7.3% zinc. This deposit has been in production since 1989. Source: Hecla Mining Company website, 2018.
has been in continuous production since 1936.